As I noted in my earlier post, today the bindery is often located on the premises of a printing works though traditionally it has been located elsewhere as a separate business. Anyway, wherever it is found, the bindery is a glue-sniffer’s paradise. This is because its whole purpose is to take the printed sheets and covers from the print-shop and transform them into finished books. An essential ingredient in this transformation is glue. If it hasn’t already been done at printing, each sheet is folded into signatures (usually made up of 16 pages). Typically, the signature is stapled through its centre fold so as to fasten all the pages together. The raw book block is formed by collating the signatures. This is often done by using a mechanical hand dipping into storage bins where the signatures are stored or by fetching signatures from a rotating carousel. It is possible to have material such as a colour insert tipped in (hand inserted between two signatures) but this is very expensive. The gathered signatures are clamped and bound together, then fastened to the cover (if a paperback) or binding material (if hardback). Today, this is usually done by using glue. 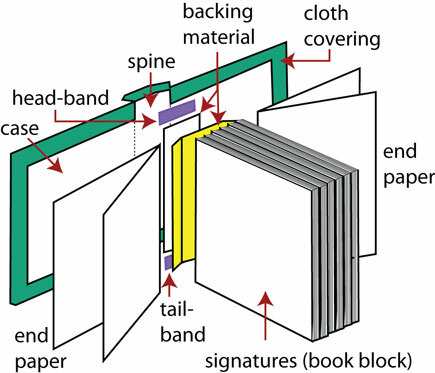 There are many different types of binding technique (see below). The book block (or actual book in the case of paperbacks) is trimmed to size. For hardbacks, the trimmed book block is fastened to the hard case. The finished books are made ready for shipment. Sometimes they may be shrink-wrapped (especially so if the book has loose items – like a DVD – to be safeguarded from theft or accidental loss). In all cases, the books will be packed in cartons and fastened together on a pallet. Sewing or stitching the signatures to backing material (and sometimes to each other), this material in turn (at step 6) fastened to end papers, then the whole package fastened to the casing material. There are lots of different wonderful names used for these techniques (saddle stitching, for instance) as well as for the materials used (e.g. head- and tail-bands, a.k.a. wibbling). Library binding is a variation of the latter type of binding, in essence a higher-quality piece of craftsmanship using more durable binding materials. However, the squeeze on library budgets has caused some libraries to opt for cheap paperbacks instead (where these are available), the calculation being that, if the first cheap paperback falls apart, a second copy can be bought (and, later, even a third). The accumulated cost is still less than the cost of buying a book (or rebinding it) with a library binding. Cloth binding, i.e. the hard case is covered with an artificial cloth material and the spine is embossed (usually in gold) with the author–title details and publisher’s logo. Often this cased book has a protective jacket/dust cover. Printed paper case, i.e. a lightweight printed cover is glued to the hard case. Semi-hardback (or super-thick paperback) using thick, flexible card over sewn or stitched signatures. In addition, the finished bound books may be enclosed with a protective slip case. This is more common with multi-volume sets (especially reference works) and for those single volumes needing to be seen as a prestigious and/or luxury product. The last step of the binding process is of course to ship out the finished books. Some of these will go as advances to the publisher (the subject of my next post) but the bulk of the stock will be shipped to the publisher’s warehouse(s), more about that later. Once the text is completely stable, and any illustrations have been sized and inserted, the typesetter paginates the book and produces a second (and hopefully final) set of proofs for checking. In urgent circumstances, it is not unknown for authors to receive only a single set of paginated proof pages, but two proof stages are more common. At the same time, you should get a proof of the finalized cover. All corrections marked on the first proofs have been correctly implemented. All figures, illustrations, captions, tables, etc. are placed where they belong (or in close proximity to this). Any illustrations look as they should (in terms of quality, size, colour, orientation, etc.). All footnotes (if used) are placed on the correct page. Chapter titles in the running heads match (or are reasonable short forms of) the real chapter titles. Page numbers stated in the table of contents, list of figures, etc. are correct. Any ‘hard’ cross-references (like ‘see overleaf’, ‘see page 43’, etc.) are correct. Pagination of the book is consecutive (with numbering of the preliminary pages as a separate series using roman numbering). Of course, any corrections and other changes to these proofs should be marked up as discussed in my earlier post. I have already discussed finalization of the cover in quite some detail elsewhere. Suffice to say here that what you should be seeing now is not some cover concept or even a well-developed draft but the final version. As such, you will need to be proofing not only for errors but also omissions (a promised photo credit in tiny type on the back cover, for instance). Given the central importance of the cover, it is wise to take special care on the cover proof. Publishers hate having to insert an errata slip in a book, not least because it is time-consuming, expensive and unnecessary (and because it is an open admission that the proofing of that book was inadequate – not a good look). As such, because this is likely to be your last chance to check the entire book (see below), be rigorous with your proofing. This means, too, that you should look at the whole book – both inside pages and cover – making sure that everything is right. (This is especially relevant because the cover and inside pages are usually produced by different people.) Otherwise you may end up disappointed when holding your wonderful new book in your hands and discovering a silly mistake. This is what happened to one of our authors a few years back. The title page she delivered for editing had an old subtitle. There was nothing wrong with this (hence it survived the editing and typesetting unscathed); it was simply the wrong subtitle. The new subtitle appeared on the cover of her book and in all sorts of marketing material. It was also the one that was registered in various bibliographic databases. Unfortunately, neither the author nor anyone at the press noticed the minor discrepancy in subtitle wording until after the book was published. She requested an errata slip. Fair enough, but I was not amused. In addition, at this stage it would be a good idea to flip through the book looking at each double-page spread (easiest done in Acrobat or Adobe Reader) and analysing the layout in a more ‘right-brain’ fashion. Are the pages balanced and aesthetically pleasing? Do the page bottoms line up? Do you like what you see? That said, it is your book, your child. If you don’t care about how it is dressed, who else will? And what will your readers think if, when they encounter your book, they are distracted by its appearance and maybe even fail to take it seriously? A wee bit of assertiveness with your publisher doesn’t harm once in a while. As with the first proofs, your job is to indicate any changes required either on the proofs or in a separate document, returning these (or a message that there are no changes) to your production editor. Usually, there is great pressure for this to be done quite quickly. As before, make sure that you retain a copy of these proofs. At this stage, however, and before you return the proofs to your publisher, you may have an extra task to complete: preparing an index. If there are minimal changes to these second proofs, then it is normal that they are used for the indexing (that is, if it is the author doing the indexing); this saves time. More about this in my next post, which starts a new section of the production process looking at indexing. And, as far as you are concerned, that is (almost) the end of the proofing process. (‘Almost’ because you should get a chance to see the typeset index and maybe even the whole book again after any second-proof changes have been implemented.) From now on, you will take a back seat as far as the production process is concerned. More proofing will be done but this will be by (or at the behest of) your production editor; as noted earlier, it is unlikely you will be involved. Time then (after the indexing) to move on with your life. Indeed, already by now, you may need to start refocusing your attention on the promotion of your book. But that is another story.